Almandite 12 light candle effect chandelier ceiling light fitting. The ceiling fitting is in a cream gold finish and dressed with faceted crystal leaves. The 12 lights are supported on arms over 2 tiers and have cream gold candle drips. The chandelier hangs on approx. 50cms of chain which can be shortened on fitting. 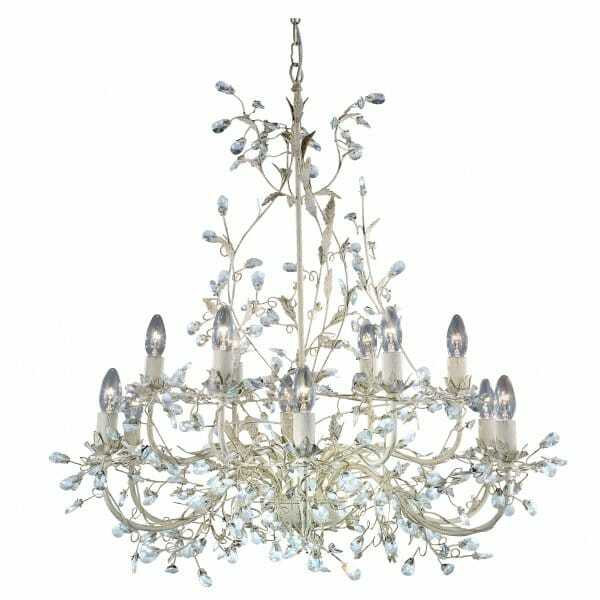 The chandelier has a romantic feel and would be equally at home in a modern home or in a more traditional setting.